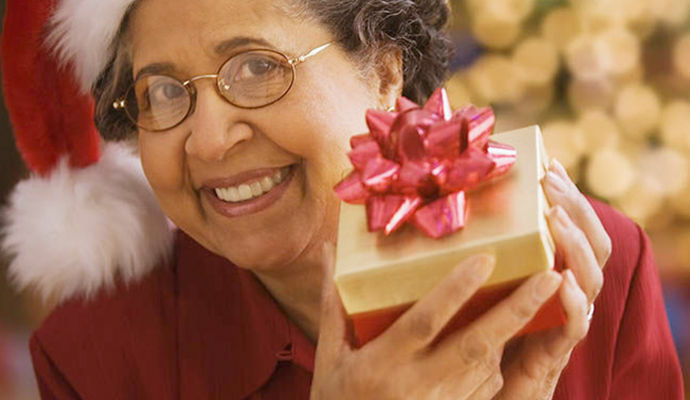 Choosing gifts for someone with dementia or Alzheimer’s can be challenging. This year we have put together a guide to help you select gift options suitable for your loved one at almost any stage of their illness; from medication management tools in the early stages to soothing fidget and sensory items for the later stages. We hope you find it useful! Picture Phones: These simplified phones make it easier for anyone living with memory loss to connect to family and friends. When regular phones become too confusing or complicated, try switching out your loved one’s phone with one that requires nothing more than the touch of a single button. Remote Controls: Specifically designed for seniors, these devices have large color-coded tactile buttons to make it easier for with memory issues to access their favorite channels. Easy to Navigate – With 6 buttons that are large and color coded, it’s ideal users that are partially sighted or elderly. No more complex and clunky TV remotes. Only takes 15 minutes to set up. The lock feature prevents anyone undoing all your hard work. Eliminates Useless Channels – Save up to 30 channels so you don’t have to wade through hundreds of channels you’ll never watch. Unforgettable Day Clocks: Traditional clocks can be confusing, especially for the elderly, people with vision impairment or those struggling with dementia, memory loss, Alzheimer’s, and other degenerative diseases. With simple displays, anyone can read the time, day of the week, and date on these clocks to help them keep track of time. 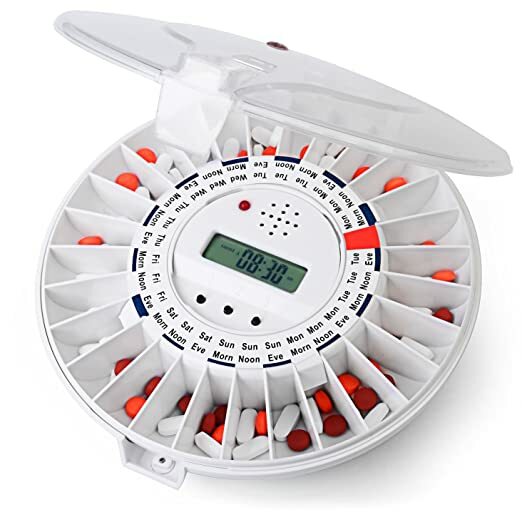 Automatic Pill Dispensers: These devices keep drug doses locked away until the exact moment they need to be taken. Featuring a timer and alerts, they protect against mistaken or forgotten dosages while eliminating the need for constant refilling. Fidget Toys and Blankets: Restless hands can lead to increased anxiety. 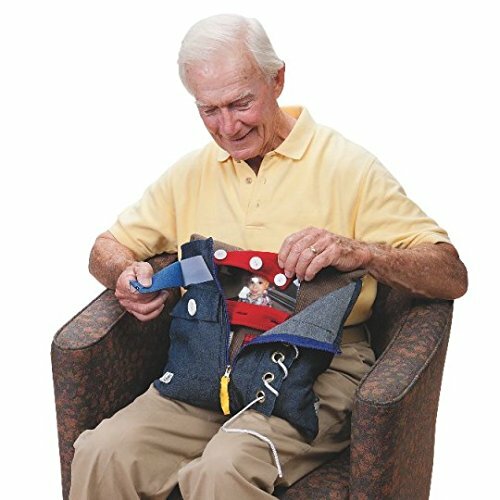 Twiddling and fidgeting provides a soothing sensation for those with Alzheimer’s, dementia, or autism. The act of using their hands in a controlled way helps calm while simultaneously aiding manual dexterity and memory retention. Soft-plastic orbit ball tethered on the inside. 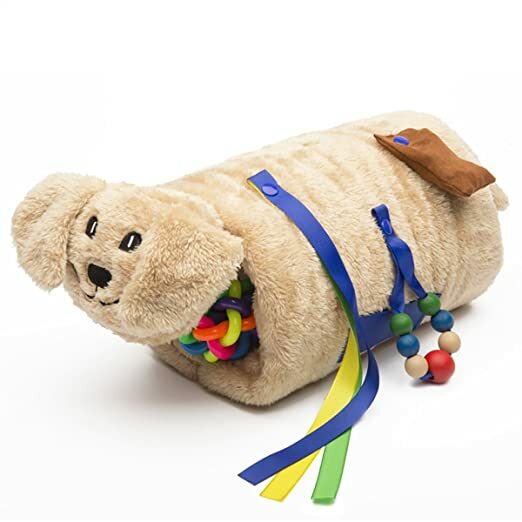 Multi-colored wooden beads, textured ribbons, a sealed buckskin crackle pouch, and a Velcro pull patch to exercise hands and mind alike. Ideal for home as well as memory care facilities. Therapy Dolls: Studies show “doll therapy” can improve the wellbeing of dementia patients in a number of ways. 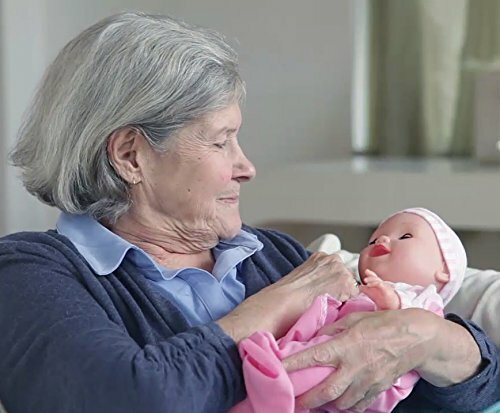 Designed exclusively for dementia patients, this cherubic doll engages seniors by giving them an object of nurturing and affection. Reusable Water Painting: Aquapaint is a unique and reusable painting product for people with dementia. Simply paint water onto the sheets and watch the image appear. 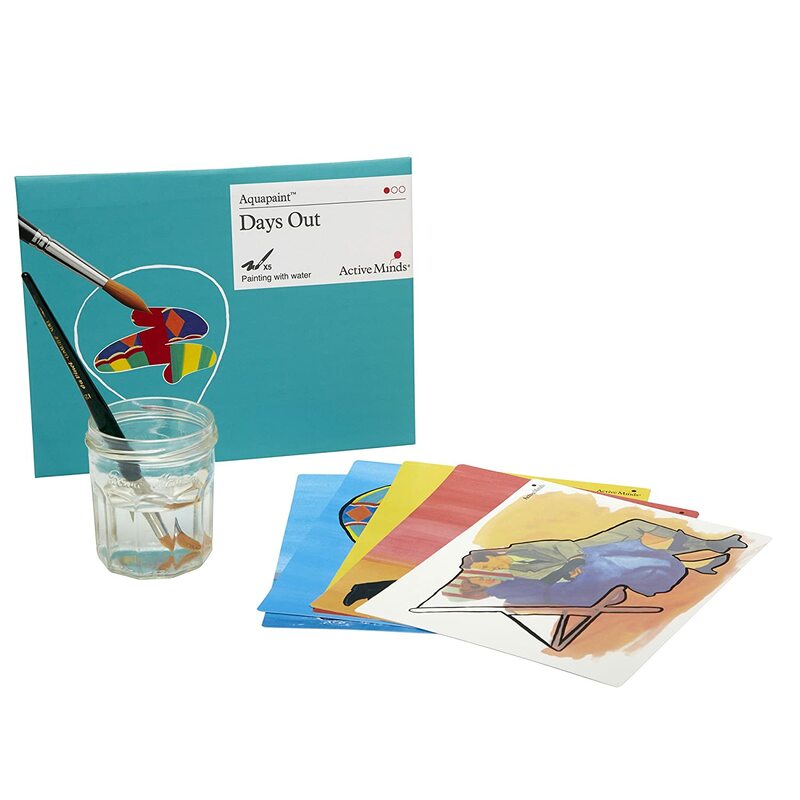 As the water dries the image will fade ready to be used time and again, lasting over 1 year with daily use. Each set comes with five different images that have been carefully selected to help start conversation when the painting is complete. 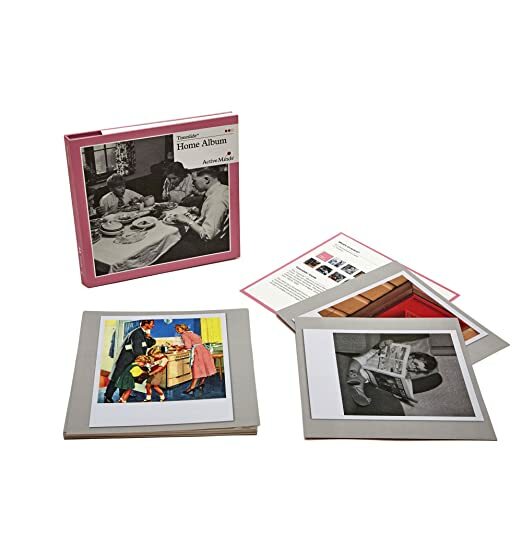 Reminiscence Cards: These cards are ideal for caregivers to use with people with mid-late stage dementia, this activity has been designed to spark conversation around some most-loved memories. To use in a group session, or one to one, simply ask the person to choose a card, then use the questions on the back of the card to initiate interesting conversations. 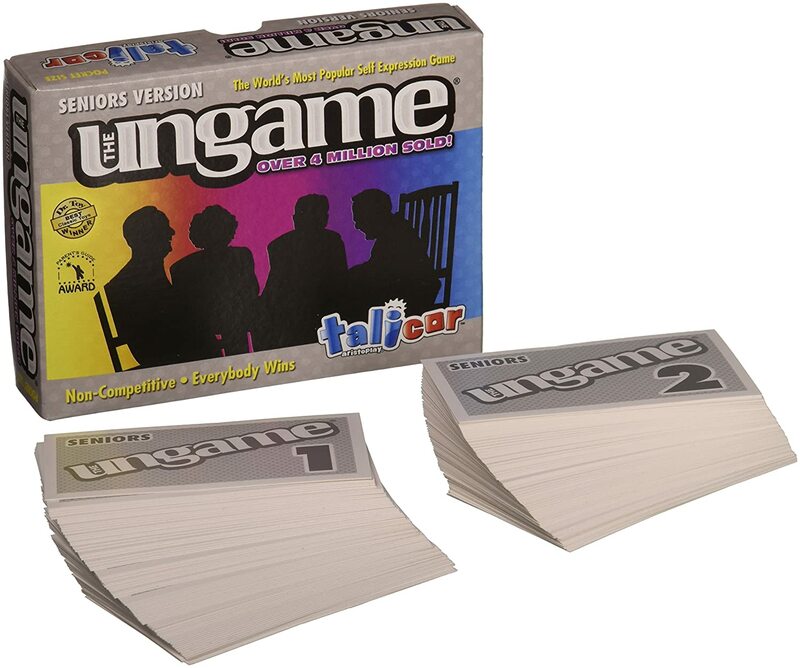 Ungame for Seniors: Take seniors down memory lane with the non-competitive game that encourages conversation and communication. A fun ice-breaker or lead-in to a serious exchange of thoughts, feelings and ideas. Use deck # 2 to share feelings, talk about values and relate experiences. Large print for easier game play. Includes 140 cards. For 2 to 8 people.